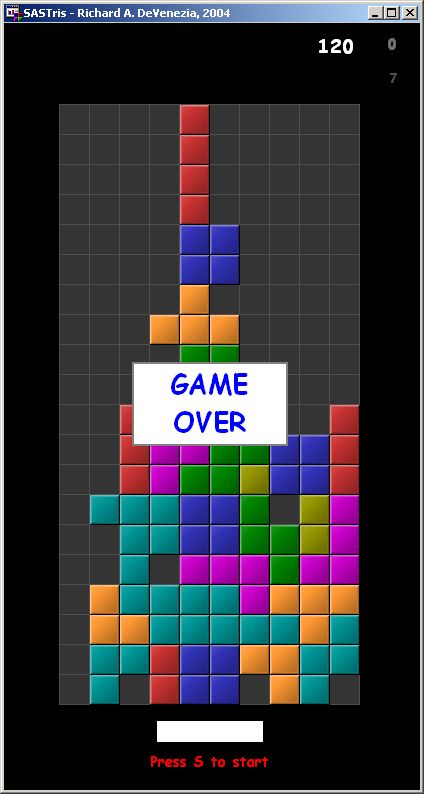 Tetris was the topic of one of my SUGI 30 papers. Press a number key instead of S to start at a higher level. Press Q key to start over. You can wiggle a piece after is has been dropped. You score only when a row is completed. Points are multiplied by level+1. The multiplier is increased when you eliminate bonus blocks. A level is completed when you clear 10 rows. Each level speeds up, up to level 10. The play field adapts itself to the size of your SAS session, but will not resize if you change the size of the initial window. Looks best on 1280x1024+. Programmer hints: The block images were created with DSGI, the images are displayed using Image Viewer Controls and get moved around. The event() function is checked every 10ms inside a timing delay loop. The delay loop controls how fast the blocks drop. The application is one frame, four classes and one scl for a method override. ~1,400 lines of well formatted and spaced code. Todo: Piece on deck preview (for 20% reduction in scoring). Thanks: Nigel, Venita, Randy, Rob, Paul, Lynn and Adam. For testing and otherwise providing feedback. This page was last updated 17 August 2004. I get the error with your tetris game (SAS 8.1), is there something I can do to fix it? NOTE: SYNC performed on GAMES.TETRIS.PLAY.FRAME. Is there something i can do to fix it. use the CATNAME statement or catalog concatenation to resolve this problem. WARNING: Incomplete termination for object Field1: _TERM_ method may not be performing a CALL SUPER(_self_, '_TERM_'). Object termination forced. ERROR: Region fill failure, operation aborted. Cool program. I wouldn't have thought you could do something like this in AF. Also, many compliments on your website. I've used some of your examples in my projects (particularly your dll examples) and it has saved me a ton of work.